The forthcoming Vidya Balan-starrer Tumhari Sulu is a fun, inspirational story of a housewife who believes that she can have a life outside the walls of her home. The trailer of the film has already received immense love and appreciation, and the film has been placed on many lists, including ours, of the most anticipated releases of the year. Besides the fact that Vidya plays the lead role of Sulu in the film, another high moment is that the film revisits one of the most iconic Bollywood songs – a recreation of Sridevi’s hit track ‘Hawa Hawai’. Interestingly Vidya Balan was barely 5 years old when the original ‘Hawa Hawai from Mr. India released in 1987. When Vidya came on set to shoot the song with co-stars Neha Dhupia and RJ Malishka, she couldn’t help but go back in time and revisit her memory of ‘Hawa Hawai’ when she was a little girl. She revealed that her memories of the song are that of being a little girl awestruck by the melody and quirkiness of the song. “I may have been five or six years old when the song released. As a child, I absolutely loved the song. I can’t believe that so many years later I am actually featuring in it. When I was informed about it during pre-production, I was both excited and anxious. It made me very nostalgic”, smiles Balan. Vidya, a well-known Sridevi fan in real life, is quick to point out that the new ‘Hawa Hawai 2.0’ is not a remake or attempt to recreate the original. It is a fun, uptempo moment in the film where the trio gets to dance on a song that they all have enjoyed listening to while growing up. 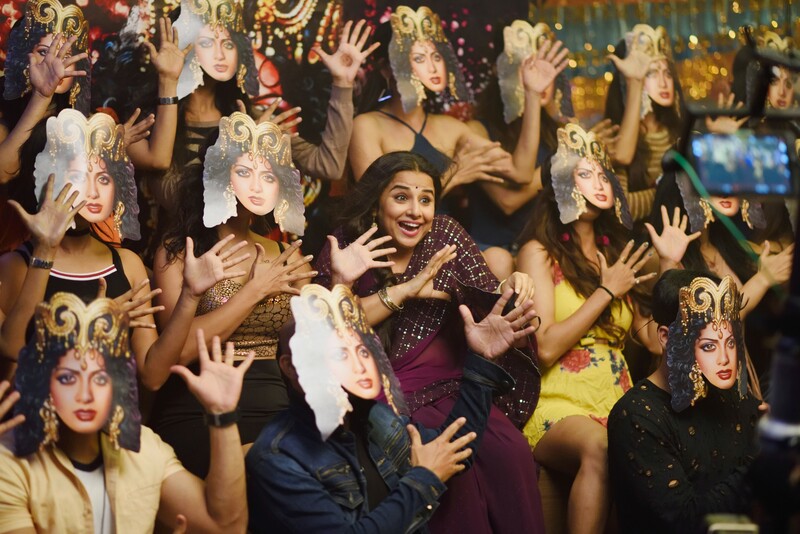 The film has an office party scene where the characters played by Vidya (Sulu), Neha Dhupia (Maria) and RJ Malishka (Albeli Anjali) are dancing to the tunes of the erstwhile Kavita Krishnamurthy track. The gratifying part is that the original vocals of Kavita have not been altered. The magic of the song is the fact that even after so many decades the tune and melody of ‘Hawa Hawai’ is etched in the minds of every bonafide Bollywood lover and still is magic. The original track was composed by Laxmikant-Pyarelal and the choreography by Saroj Khan. ‘Hawa Hawai 2.0’ is recreated by Tanishk Bagch, with choreography by Rajeev Surti. From what we saw Hawa Hawai 2.0 is the handing over of a legacy from one superstar Sridevi to another, Vidya Balan. Tumhari Sulu, directed by Suresh Triveni, hits theatres on November 17. It is a T-Series and Ellipsis Entertainment film. Stay tuned we have fabulous interviews with Vidya Balan and Suresh Triveni coming up soon!